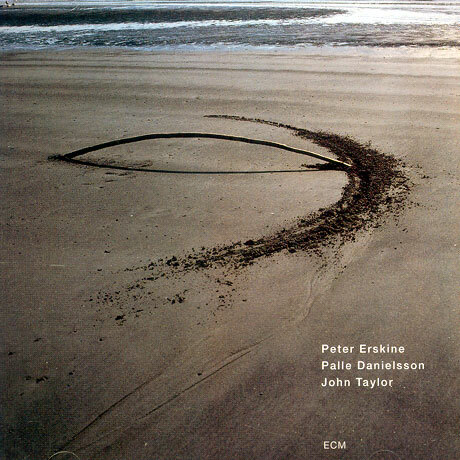 With this first recording in the company of his European trio, which includes pianist John Taylor and bassist Palle Danielsson, American drummer Peter Erskine made a lasting, if subdued, statement of intent. Its contours feel familiar, its moods even more so, and its overall feeling is one of peace and quiet passion. Considering the fine talent girding every corner of this triangle, it might seem unfair to single out one musician above the rest, but Taylor’s richly harmonic style is difficult not to praise. Not only that, but his compositional contributions make up the bulk of a set awash in tuneful elegance. Take, for instance, the nine-and-a-half-minute opener, “New Old Age,” which seems to tell the story of a life in full circle. Taylor’s lush motive is the album’s heartbeat. Danielsson expands its EKG line and paves the way for Erskine’s airy considerations. This pattern repeats the cycle of experience, spinning the wheel of time and landing on “Clapperclowe.” A lively tune softened by a montuno twang and featuring some buoyant soloing from Danielsson, it also features a massage-like patter from Erskine. Another Taylor notable is “Evans Above,” a soulful Bill Evans tribute that sets Taylor dancing on clouds as he glides effortlessly across landscapes past and present. Featuring an exquisite solo from Danielsson, flexible as a gymnast in his prowess, it is a glowing piece. “Pure & Simple” might as well be called “Pure & Cymbal” for Erskine’s astute punctuations, each chiseling away at Taylor’s meteoroid on its path of sonorous fire. Erskine himself contributes only one tune: the sublime “On The Lake.” Its still and reflective sheen obscures a bass that moves like an evolutionary mystery beneath Loch Ness, even as home movies of children swimming, lovers canoeing, and friends gathering at the water’s edge flicker past to the rhythm of the composer’s brushes. Three ballads by Vince Mendoza (whose tunes were heard to such great effect on John Abercrombie’s Animato) brings out the trio’s tenderest side, as in the fine support all around of “Amber Waves.” And how can the empathic “Heart Game” not move us? It tugs at the heart and never lets go. If synergy is your bag, look no further than the trio’s closing rendition of “Everything I Love.” This classic Cole Porter joint is a window through smoke and time and practically bursts with effervescence at Taylor’s touch. You Never Know would seem to have ushered in a new era for ECM, setting standards yet again for quality of recording, performance, and audience consideration. A dulcet and memorable date that lingers like the notes of a home cooked meal.